Water Leaking from a Ceiling Fan or Light Fixture: Is it Dangerous? Water Leaking from a Ceiling Fan or Light Fixture: Is it Dangerous & A Fire Hazard? Contractor Quotes: Let's Make Your Project a SuccessBlogHouseWater Leaking from a Ceiling Fan or Light Fixture: Is it Dangerous & A Fire Hazard? Water leaks won’t generally send homeowners like you in a panic. That is, unless you see that the ceiling leak is coming somewhere that will likely get your electrical appliances wet. Especially your shiny 60-inch television set that you got after camping out overnight during the last Black Friday sale. Or worse, you see water coming out from your light fixtures or your ceiling fans. You’ll probably wonder if you need to get in touch first with an electrician, a plumber, your insurance provider, a roofing contractor, or the local fire department already. In most cases, it is the plumber and the electrician you need to contact first. That is of course a fire has already started as a result of the leak. But whatever you do, do not ever touch the affected fan, light fixture, or other electrical appliance on your ceiling, or even attempt to fix the leak on your own if you don’t know how to do so. Any simple mistake while working on it may have life-changing consequences. On its own, ceiling leaks are hardly fatal – after all, you just have to deal with a little water. But leaving it alone for a long time? That’s when you’ll eventually run into problems. Water marks, bubbling paint, cracks, wood rot – these are just some of the things you can expect. But if the ceiling leak occurs near electrical appliances or wirings, that’s a different story. This leak will no longer just irritate you – it can even prove fatal. Your ceiling can come crashing down – ceilings are normally made out of gypsum or wood, which are not resistant to water. Leaks can saturate them and turn them into wet, soggy messes if exposed to it for a long time. When this happens, they become soft and will eventually be unable to hold their weight, as well as the fans and light fixtures mounted to it. It’s not just damage to your home and your belongings that you should watch out for when this happens. If your ceiling suddenly collapses, the chances of anyone getting hurt are high. Anything attached to a wet ceiling has the potential of suddenly crashing down as well – they may even be the first to fall before your ceiling does . There is potential for a water leak to be a fire starter – that is, electrical fire – you are probably familiar with the fact that there are different possible reasons why fire starts in a home, but not everyone knows that not all fires can be stopped by using water. In fact, there are instances that adding water to the mix can even cause it to spread faster. Water leaks may cause a fire, albeit a little indirectly. These leaks can cause mold or corrosion on the electrical wires, which can then result in these wires experiencing short circuits and possibly starting a fire. Electrical fires are not one of those that you should put off using water. You can get the shock of your life or worse, it can prove fatal – electrical shocks are something that almost all of us have experienced at some point, usually when we plug in appliances with damp hands or were not paying attention when doing so. Do you remember how it feels? If before you only felt a mild tingling sensation, this is hardly the case when you get electrical shocks that involve water. This is because water contains various impurities that are capable of aiding the flow of electric currents. At the same time, it strengthens the effect of electrical shocks. Even your switches can be affected when water leaks appear near the fixtures with leaks. You may not realize it but the electrical current present that is affecting your fixtures may have already flowed to their respective switches through their connections. Touching those switches, or even the water that has settled somewhere that came from those particular leaks, can give you nasty, if not fatal, shocks. Damage, injury, or death. These are very real possibilities when you deal with ceiling leaks that have also compromised your electrical connections. How many times have we been told as children that there are some things that should never be put together, and combining water and electricity tops that list? And if you were one curious child, you probably discovered for yourself why it is a horrible combination. On its own, water is harmless. The impurities found in water are what you should watch out for, since they are the ones that are the actual conductors of electricity. Only the type of water known as low-conductivity water, referred to as LCW, is free from these impurities. Unfortunately, households use tap water and this is not considered an LCW. This is why ordinary tap water puts you at risk when it comes into contact with electricity. We mentioned earlier that the contact between water and electricity will intensify the shock anyone will feel when they come into contact with it. This is because water flows freely and the more you have contact with an electrical device that has been compromised with water, the more intense the electrical shocks you will feel. Imagine each droplet of water that is in contact with electricity as a needle. Even a single needle is painful, what more if you get pricked by a lot of them? This is what you can expect to feel when you get in contact with wet electrical appliances that are still powered up, such as in the case of ceiling fans and light fixtures that are affected by leaks. Once you touch these wet appliances, the shock is often too strong that anyone will hardly have the strength to let go. The cartoons or portrayals of people unable to immediately let go when they get to experience shocks is true. And not letting go of the source of the electrical current is downright dangerous. Death by electrocution is real. Don’t let water mix with electricity, moisture and leaks included. Always turn off the power when working on anything that uses electricity. Appliances can be unplugged, lights should be turned off, or the connected breakers of wirings or connections to be worked on must be switched off. With the help of a non-contact voltage tester, check to see if any power remains on your appliance when the circuit breaker has been switched off before working on them. If you are unsure of handling electrical-related issues at home, get in touch with a qualified electrician instead. Don’t attempt doing electrical repairs if YouTube videos are your only guide. When working on electrical connections, wirings, and especially batteries, make sure that the tools you use are properly insulated. Never insert or remove the plug of any electrical appliance from the socket with wet or even damp hands. Removing the plug of any appliance while it is “under load” or operating, is something that should also never be done. This is especially true for large appliances. Electrical arcs can form when you remove the plug of a running appliance from the socket. Install covers on sockets that can just be removed when plugging in an appliance, especially if you have small children that live with you. You can also choose to cover the entire sockets or only the outlet plugs. For sockets that will be frequently used or are most at risk of shocks, such as those in kitchens, bathrooms, outdoors, and in older homes, install GFCI, or Ground Fault Circuit Interrupters, that will automatically cut off power when they detect electrical imbalances. Observe the condition of your electrical appliances, especially when in operation, and immediately get it checked out when it seems to work differently than it is supposed to. Any exposed or bare electrical wirings should never be touched and must be seen to by an electrician immediately. Only use lightbulbs that matches or is within the range of the maximum wattage and voltage of the sockets where you will install them. This will also prevent electrical overloads, as well as keep the bulbs from exploding. Be wary when using appliances with capacitors. These capacitors store up electricity and will even give you a strong jolt or two, even if the appliances they are installed in are switched off. Three-prong plugs are the most ideal plug to use because of the electrical current grounding capability of the third prong. Even if it is removable, don’t get rid of it. Plug it in a socket with the third prong in place. It’s common for households to use power strips and when you do so, make sure not to overload it. Cramming as many plugs as you can in a single socket with the help of adapters puts you at great risk of short circuits. Also, keep the wirings organized. Stop using appliances or outlets that produce sparks when being plugged in, heat up when connected to an outlet, or have cords that are damaged or with exposed wires. Only use appliances with voltage inputs that match your sockets. If not, make sure to use a transformer to match the voltage input of your appliance to the socket. Never directly plug in an appliance with a voltage input different from the socket. If anyone experiences an electric shock, avoid immediately touching them with your hands. Traces of electrical currents may still be present in that person a short while after he or she gets shocked, and you might also experience it. The best way to prevent experiencing electrical shocks is to handle electrical connections with care. It doesn’t matter if you are just plugging in or unplugging your appliance – you still need to properly do it. And when you run into issues that are electricity-related, don’t attempt to work on it if you don’t know how. Get the services of a professional straightaway. Sometimes, issues at home appear that will require homeowners to quickly shut down power using their circuit breaker. The power to the entire house may be cut off temporarily, or just the breaker of the electrical connection having issues. Cutting off power using your circuit box is an easy task that even you can do – you just need to learn how to do so. The most important thing you need to know is that there are two kinds of breakers present, the main circuit breaker and the branch circuit breakers. As the name implies, the main circuit breaker is used to cut off power for your entire house when there are electrical issues that a professional need to work on, or electrical overloading is already a possibility. The main circuit breaker is often either placed at the top or in a separate location in the breaker box and is usually the largest in size. Unlike individual breakers, the main circuit breaker will rarely ‘trip’ to shut off power in the whole house. Individual branch circuit breakers, on the other hand, will only cut off power to specific circuits where they are connected to. So, if you flip the switch the circuit breaker for the master bedroom to off, only the power for that room will be cut off. These individual circuit breakers are the ones that are grouped together. And when there are certain conditions they detect, these circuit breakers will automatically trip and cut off power in the problematic electrical connections. A good practice done by most professionals is to place labels beside each individual circuit breaker to indicate which circuit it is for. This allows homeowners like you to easily see which breaker tripped, as well as find the one that needs to be switched off. You don’t want to play a guessing game and switch off all circuit breakers one by one until you discover the breaker that you need to turn off temporarily. Cutting off power at the circuit breaker box is easy – you just have to flip the switch to its ‘off’ position. Yes, that’s the only you need to do to cut off power. However, it doesn’t mean that you can just turn off the main circuit breaker anytime you get frustrated and can’t seem to find which individual breaker to switch off. Cutting off power to your home using the main circuit breaker is normally done as a last resort and in times where major electrical work needs to be done in your home. If you need to turn off your main circuit breaker, you should never do so immediately. Always switch off all of the individual circuit breakers on your box or panel first, but do so one at a time. Once all these branch circuit breakers are in the off position, that is the only time you can flip the switch of your main circuit breaker to the off position. If you see leaks on your ceiling that have affected the fixtures installed on it, you first need to look for the circuit breaker involved if it has yet to automatically trip (which is likely the case). The breaker will depend on the wirings or connections made by the electrician during the construction of your home – the fans and fixtures may share the same breaker or they may have individual breakers. Once you find the right breakers, you should switch them off. That way, the electrical current will no longer flow with the water leaks and the safety risks are minimized. Still, let the professionals handle it even if you were able to successfully cut off power to the fans and fixtures. Unfortunately, it is not just water leaks affecting your lights and fans that you should watch out for. Roof leaks pose all sorts of issues – from the minor annoyances to the serious ones that can have catastrophic consequences. Do consider it an emergency to get it fixed and have it done ASAP. Growth and reproduction of mold and mildew – this is one of the most serious effects of roof leaks, as anyone in your household can experience various health issues. It can be as simple as allergic reactions, or more serious ones like respiratory infections. Mold reproduces fast and is capable of moving all over your house via your HVAC systems. No one is safe in your home when that happens. Aside from possible health issues, you will also likely deal with damage when mold starts growing in your home. 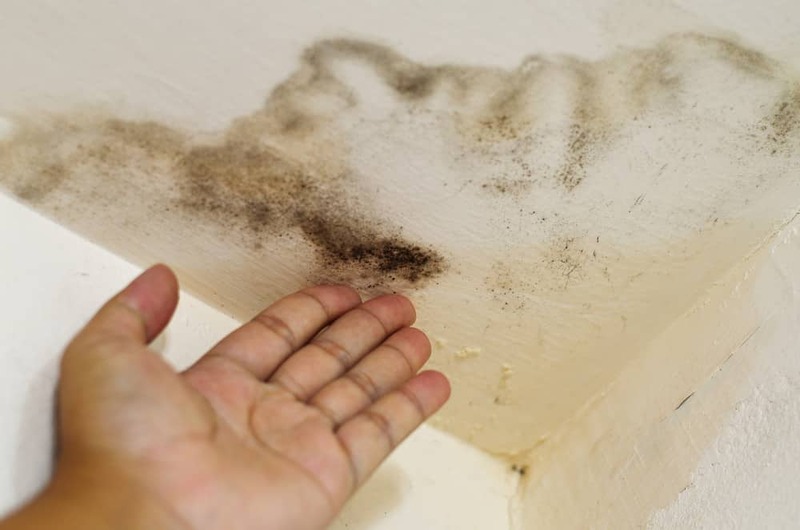 Mold is also capable of not just unsightly marks on your walls but they can also physically damage parts of your home, such as your tiles on the ceiling, wood frames, coverings on your floor, and wallpaper. Once they appear, they are very difficult to get rid of and will likely require you to replace the affected and damaged parts. Damage to your attic and ceiling – the first sections of your home that would be affected when your roof leaks are those that are directly in its path, which is usually the ceiling or attic. In most cases, you can see paint peeling off, discolored, or bubbling, wood components to rot, and getting water all over your stuff in the attic when leaks are present. Your home’s insulation is affected – most homes have their insulation installed up on the attic. But when water leaks appear, it will cause them to form clumps, affecting its performance. These clumps are also the perfect breeding ground of mold. And because your insulation is no longer as effective as before, you will have to make the heating system in your home work longer or at higher temperatures to get the level of comfort you want or are used to. As a result, you will be left with higher bills. Water as a result of leaks can cause accidents – sometimes, you don’t see the puddles of water on the floor until it is too late and you are left with some rather painful proof of their presence. Slips and spills are quite common, especially when you fail to quickly mop up the water buildup. Weakening of various structures – some materials used in your home are not immune to water. in fact, they even get weak when they get prolonged exposure to it. For roof leaks, the most commonly affected are the wood construction framing, which can break anytime once they start to rot. And when this happens, your roof has a high chance of crashing down in the future. All these should convince you of the fact that roof leaks must never be underestimated. They are not just an issue that caused you to have to postpone your reading, press pause in the middle of your Netflix marathon night, or wake you up while in the middle of a much-needed shut-eye. 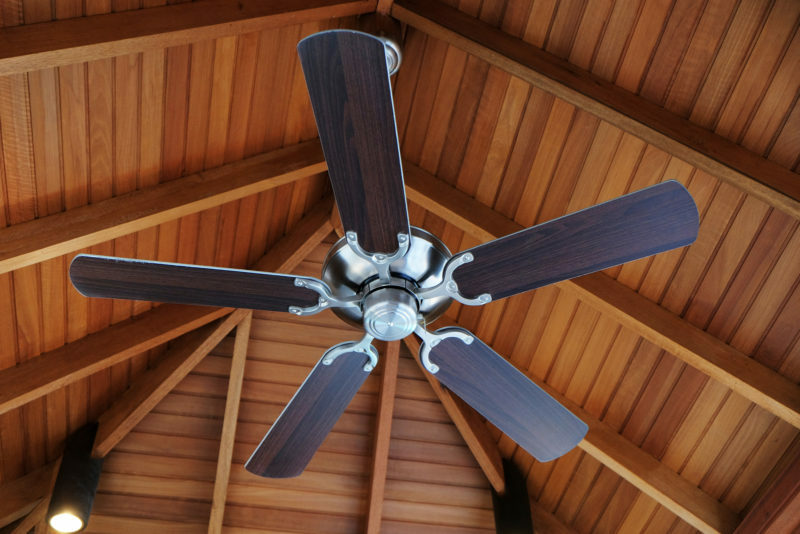 If you made the unfortunate discovery of ceiling leaks present near your ceiling fans or light fixtures, or worse, they are already directly affected by it, it might cause you to lose your head and make you forget what you need to do. Or worse, you might go for what is the most common mistake people make in this situation. That is, turn off the switches of those fans or appliances that are compromised by the water leaks. Some people find out too late that it’s a horrible idea when they touch the switch and get to feel the unfortunate effects of electric shocks. They’re lucky if they escape unscathed. Panicking in this situation will do more harm than good and might even cause you to do things that shouldn’t be done, such as the scenario above. In case it happens to you, you need to put everyone’s safety first. This means not letting anyone near the leaking ceiling, nor touch the switches of the affected fans or fixtures. Immediately go to where your circuit breaker panel is placed and switch off the relevant breakers. If you have a non-contact voltage tester, use it to carefully check if there is no longer any electric current flowing on any appliance in the same circuit as that of the fans or fixtures affected by the leak. No matter what, don’t touch those appliances that have been reached by the leaks. It doesn’t matter if the power to it has been shut off. Don’t touch them at all. As soon as this is done, call an electrician and a plumber or a roofing contractor asap and explain what happened. Aside from them, also get in touch with your homeowners insurance provider, if your home is insured, to report the issue and possibly file a claim because of it. Use buckets, mops, towels, newspapers, or anything absorbent to collect or clean up the water that settled on various surfaces to avoid more water damage and even possible injury. Avoid doing any DIY work to address the issue because this may cause your insurance claim to be voided. While waiting, you can also try to trace and see the origin of your ceiling leak. Observe how strong the leak is, if it is possible for you to do so. And if you manage to find it, you should cut off its water supply to temporarily stop the leak until it can be seen to by a professional. This is because aside from roofs, other possible sources of ceiling leaks are issues with your supply pipes, wastewater, HVAC units, or bathroom fixtures. If you confirm that any of these is the issue, and not the roof, you can either have the plumber address the leaking pipes or bathroom fixtures or your HVAC unit’s condensation line before having the ceiling fans or fixtures checked out by the electrician. It is important that the source of the leak be addressed first by a plumber before the electrician resolves the issue with your ceiling fans and light fixtures. Even if the water-damaged fixtures and fans are replaced with a new one but the ceiling leak has yet to be resolved, you can expect the new units on your ceiling to be affected as well by the existing leaks. Your fans and lights that have been affected by the leaks will need to be replaced, as any appliance that got into contact with water should no longer be used. If not, the risk of those appliances getting fried or shorting, as well as causing fires, increases exponentially. Your senses will be the one you will rely on the most when it comes to leaks. Use your eyes to see any visible water buildup or water drops, your hands to feel where damp spots are, and your ears to listen to the sound of water droplets. Leaks are not that easy to find, since they can happen anywhere. Unless they are obvious, you will have to depend on the skills of a professional to pinpoint the exact location and origin of the leaks. What you can do at best is to narrow down their area. To do so, you can observe where the water coming from the leak has settled. Using your bare hands, touch the nearby walls or ceilings for any dampness. If you feel a dampness in a particular area or section, this means the leak is coming from somewhere there. But if somewhere on the ceiling seems to be the source of the leak, don’t attempt to touch even the ceiling itself. This is especially true if your ceiling has fixtures and fans installed and you suspect the leak coming from somewhere near those appliances. You might accidentally get an electric shock when you come into contact with the compromised fixtures. You can also listen and try to use the sound of water drops to get a good idea of where the leak is likely to be found if you can’t feel any dampness on the area you suspect. Water drops can make noise of they hit an object or surface and you should use that to your advantage. When it comes to tracing the origins of a leak, you are limited to discovering the general area of where it may be found. Finding the exact location, as well as what caused the leak to happen is something that only professionals are capable of doing. And this is why you need to get their services if you have leaks anywhere in your home, not just in your ceiling, and especially if these leaks have started to affect any electrical appliances or fixtures you have. Always prioritize your household’s safety over worrying how much it may cost you to get leaks repaired.